Abbildung: Canadian Ice Service via Steven Goddard. Though North America is a full month into astronomical spring, the Great Lakes have been slow to give up on winter. As of April 22, 2014, the Great Lakes were 33.9 percent ice covered. The lake they call Superior dominated the pack. In the early afternoon on April 20, 2014, the Moderate Resolution Imaging Spectroradiometer (MODIS) on NASA’s Aqua satellite captured this natural-color image of Lake Superior, which straddles the United States–Canada border. At the time Aqua passed over, the lake was 63.5 percent ice covered, according to the NOAA Great Lakes Environmental Research Lab (GLERL). Averaged across Lake Superior, ice was 22.6 centimeters (8.9 inches) thick; it was as much as twice that thickness in some locations. GLERL researcher George Leshkevich affirmed that ice cover this spring is significantly above normal. 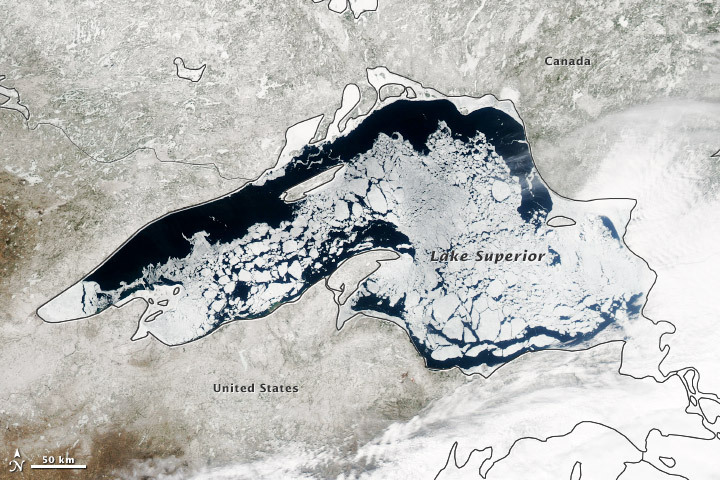 For comparison, Lake Superior had 3.6 percent ice cover on April 20, 2013; in 2012, ice was completely gone by April 12. In the last winter that ice cover grew so thick on Lake Superior (2009), it reached 93.7 percent on March 2 but was down to 6.7 percent by April 21. Gore spends most of his time on climate issues, running his NGO and giving speeches, but even those operations have scaled back, too. Before Obama’s historic election, Gore had pledged to spend $300 million to pass a climate bill, telling CBS’s 60 Minutes in 2008 that his new Alliance for Climate Protection would lead a “blitz as sweeping and expensive as a big corporation’s rollout of a new product.” At its peak, the alliance had more than 230 employees and field operations in 28 critical battleground states. It reported a high of $87.4 million in grants and contributions in 2008. But with no big climate bill on the table, budgeting and staffing are much smaller now for Gore’s group, with 41 employees in the United States and donations around $7.6 million. It also has a new name – the Climate Reality Project – and a different focus, training select members of the public through three-day seminars where the former vice president lectures for an entire day and through interactive online tools that seek to engage a casual, drive-by audience by showing how a warming planet will lead to poorer quality beer and underwater golf courses in Florida and Hawaii. Add up the losses and Gore confidants admit it has taken a toll. “There’s been a lot of frustration, for many decades,” says Peter Knight, a Gore business partner who served as his chief of staff in the House and Senate. Ganzen Artikel lesen (5 Teile).